Fraction math worksheets for testing kids from 1st to 7th grades, concepts, adding and subtracting, converting fractions. Fraction math worksheets for kids from 1st to 7th grades. These math tests on fractions makes teaching easy for teachers and parents of kids in primary school. 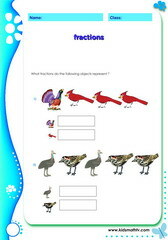 We offer fraction activities like: introduction to fractions, fractions illustrated with pictures, fractions as part of a group, recognizing fractions, adding and subtracting fractions, division with fractions, finding the LCM of two fractions, converting fractions to ratios and decimals etc. Each math worksheet has an answer key which makes them easy for use by parents who wish to give homework and by teachers who need to crosscheck their tests. 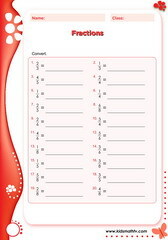 It also makes it easy for kids to practice and check their answers. These pages are in PDF printable format and can be downloaded free at any time. 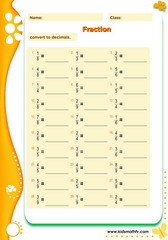 Practice Fractions halves thirds with this worksheet. 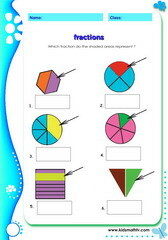 Practice Fractions with this worksheet. 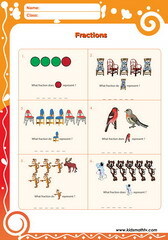 Practice Fractions of objects illustrated with pictures with this worksheet. 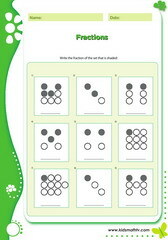 Practice Fractions shown with shaded dots with this worksheet. Practice Fractions with shaded circles sheet 1 with this worksheet. 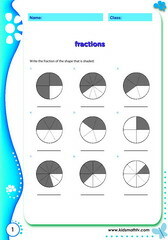 Practice Fractions circles squares with this worksheet. Practice Addition of fractions with this worksheet. 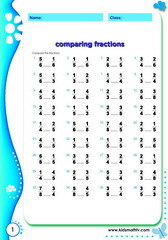 Practice Comparison of fractions with this worksheet. 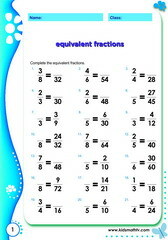 Practice Equivalent fractions with this worksheet. Practice Fractions addition 1 with this worksheet. 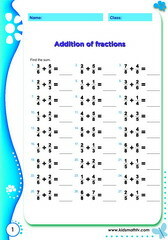 Practice Fractions addition 2 with this worksheet. Practice Fractions comaparisons with this worksheet. Practice Fractions of circles with this worksheet. 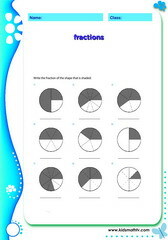 Practice Fractions shown with pictures with this worksheet. 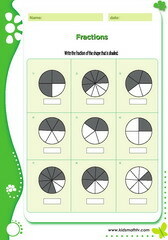 Practice Fractions shown with circles squares with this worksheet. 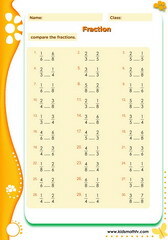 Practice Comparing fractions with this worksheet. 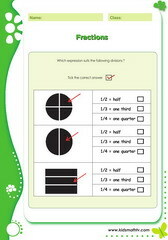 Practice Fraction of circles with this worksheet. 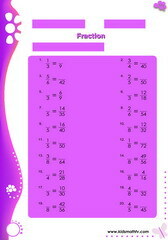 Practice Fraction of numbers with this worksheet. Practice Fractions subtraction with this worksheet. Practice Multiply fractions with this worksheet. 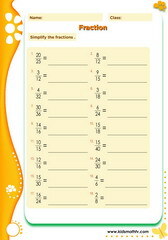 Practice Multiply fractions by whole numbers with this worksheet. Practice Simplify fractions with this worksheet. 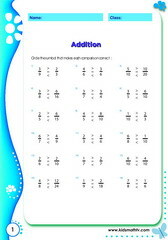 Practice Addition of mixed fractions with this worksheet. Practice Division of fractions with this worksheet. Practice Division of mixed fractions with this worksheet. 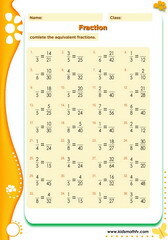 Practice Multiplication of mixed fractions with this worksheet. Practice Subtraction of fractions with this worksheet. Practice Subtraction of mixed fractions with this worksheet. Practice Fractions withdots with this worksheet. Practice Adding fractions with this worksheet. Practice Fractions addition with this worksheet. Practice Fractions multiplication with this worksheet. 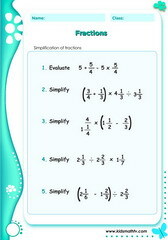 Practice Fractions simplification with this worksheet. 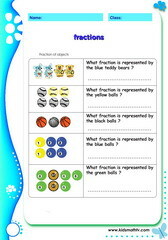 Practice Impropper fraction comparisons with this worksheet.